Just 2 hours north of Boston! ATTENTION all benders, Jonny Hustles, Clapper Christinas, Doug Glatts and Debby Danglers of the world: the Yeti Cup awaits your arrival. It will be the most fun you'll have all winter! The Frostbite Face-Off is the hockey players' alternative to a ski weekend away. Register now! Frostbite Face-Off is a 21+ men's and women's pond hockey tournament at the Lake Morey Resort in Fairlee, Vermont. 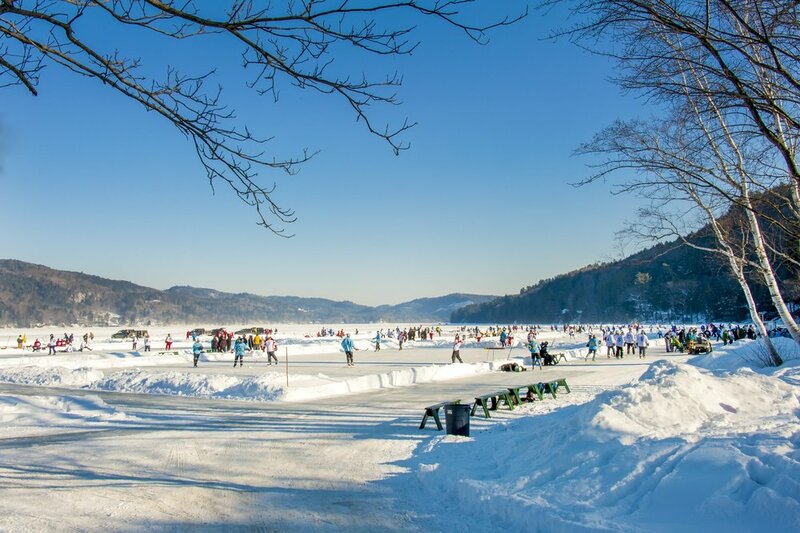 Lake Morey has state of the art equipment, including zambonis, so you can count on high quality ice all weekend. A fantastic feature of our location is that the hotel is right next to the rinks where games are played; additionally, all important amenities are onsite (restaurant, bar, pool, hot tub and more). You won't need to leave the resort all weekend! The resort is located right on Lake Morey, so you will be able to walk right from the resort onto the rinks. Additionally, there will be sponsored theme parties at the hotel on Friday and Saturday night. Please register your team for the division that fits your skill level. Pond hockey is all about having those great locker room guys or gals - so ALL skill levels are welcome. Yeti (A Division) and Sasquatch Divisions (B/C Division and D Division teams) will be placed based on overall team experience. Co-ed teams should enter the open division, and please be aware of your overall team level when choosing your level of play. The Women's Division are separated by skill level, similar to the Open divisions. We will consolidate or expand divisions based on the skill level of the teams. If you have a question on your level of skill, please see the bottom of this page for further direction, or please contact us. We will make final determinations based on your responses on the registration form and in consultation with your team captain. PS: Don't worry if you're a bender. Own it. No one is going to remember the good teams, they will remember the team that carved out water front property in their opponents heads, despite being down 21-0 5 minutes into the game. Create your legendary weekend, and have everyone walking away saying, I can't wait to chirp those guys or gals next year. DJ, live music and photo booth! Championship Sunday and awards ceremony! Teams will be placed in division conferences. All games on Friday will begin after 3:00 pm. On Saturday, teams will play against the other teams within their conference. Based on the standing from those games (wins, goals against, goals for & goal differentials), the top teams in each division will be placed into the Yeti’s Cup championship bracket single elimination playoff. Playoffs will be held on Sunday (weather depending) and teams will be bracketed based on their team record, with tie-breakers being goals against, goals for, and goal differentials. The Open and Women's Yeti divisions, are comprised of A/B level players. These are the most competitive divisions and are intended for players and teams who have competed and still compete at a high level. We recommend having 4-6 players minimum on rosters, but teams should be no more than 8 players. The Open and Women's Sasquatch divisions are intended for recreational players or C/D level league players. Once your team is registered, we will send out a separate email to all those that sign requesting that you to indicate the level of play of your players. Check out footage from Joseph Morel at Joepics.com from our 2018 tournament at Lake Morey Resort!